Gold continues to trade out of its post rate hike low (see Here) – akin to the taper low in December 2014. 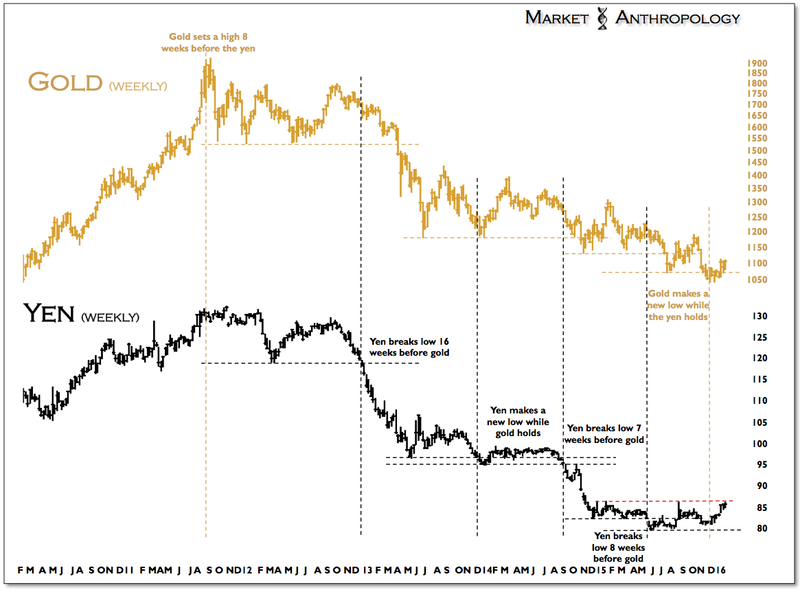 Our view has been while they both represent similar market reactions, the broader reflection that's played out in the currency markets over the past two years – presents a significant catalyst for gold going forward. 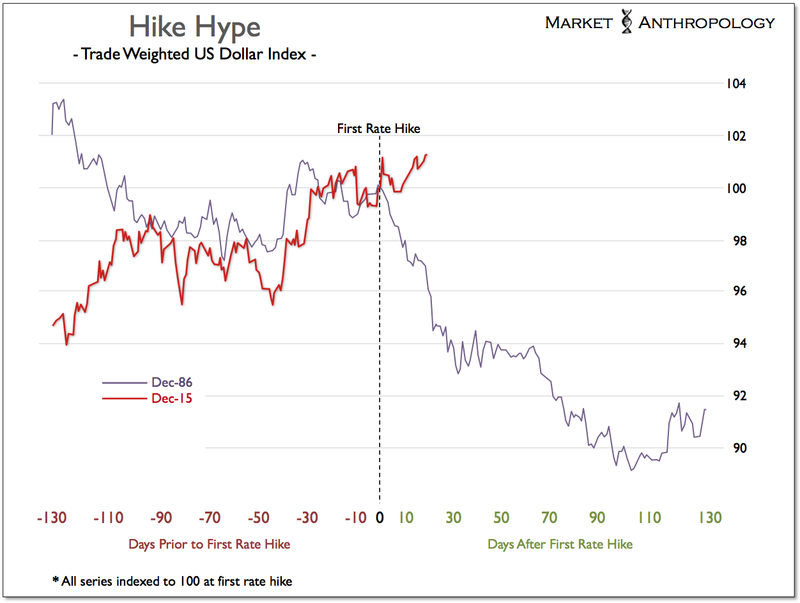 Specifically, we expect a much weaker US dollar this year. 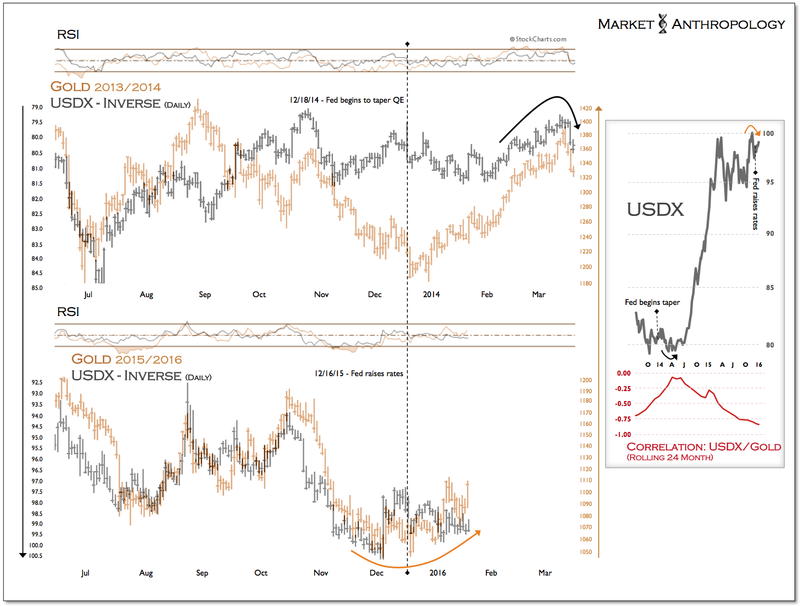 Unlike gold's Q1 2014 rally that coincided as the US dollar was basing and exhausted as the dollar broke out; gold has been stepping higher since the December rate hike with what we perceive as precarious underlying support for the US currency – that remains stretched at a relative performance extreme. 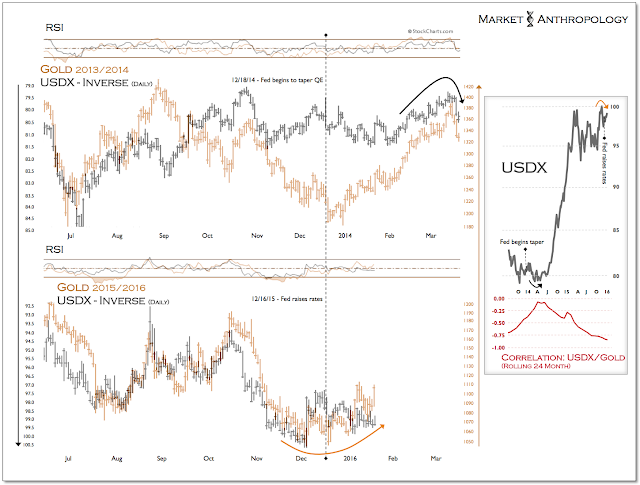 From a longer-term perspective, the inverse correlation between gold and the US dollar index has been strengthening over the past two years, with precious metals leading the downside move in commodities as the US dollar rallied appreciably. 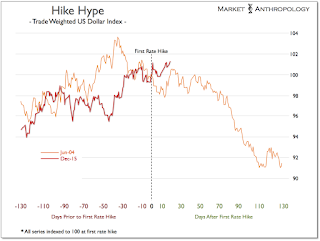 We know in past cycles – and characteristic of markets forward discounting dynamics, the dollar strengthens during the expectation phase of tightening and typically begins to weaken as markets become confident that the Fed will move. Commonly understood by traders as buy the rumor/sell the news, we've suggested its become – buy the hype/sell the bluff with the dollar. The bluff being: the posture and expectations shaped from comparisons to more conventional tightening cycles would ultimately have stronger influence within the markets, than the actual structural significance of a fractional hike. Granted, this is par for course with the Fed and monetary policy over the past 7 years, where the behavioral reflex inferred was arguably as or more important than the structural transmission mechanisms themselves. 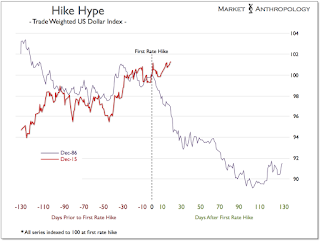 Nevertheless, the dollar has walked a similar line going into the rate hike in December, regardless of whether the Fed's bark-plots eventually measure up with the reach of previous tightening cycles. 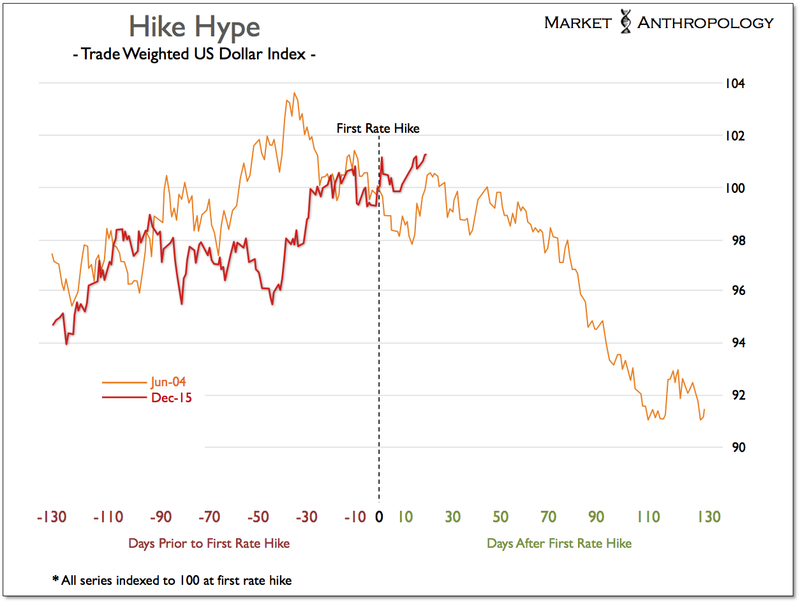 With an expectation phase for this cycle commensurate with the extraordinary span of ZIRP, the window for participants to build assumptions in towards the dollar has been historic. 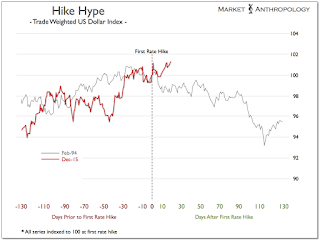 Consequently, the move in the dollar over the past two years has been extreme; arguably, from a relative performance perspective – as its secular blow off top was in 1985. As equity markets stumble and expectations of further rate hikes diminish, broad support for the dollar should modulate lower. Increased pressure from the yen, which is attempting to break out and from euro strength – as it became a major funding currency for the markets over the past two years, is leading the move for now. 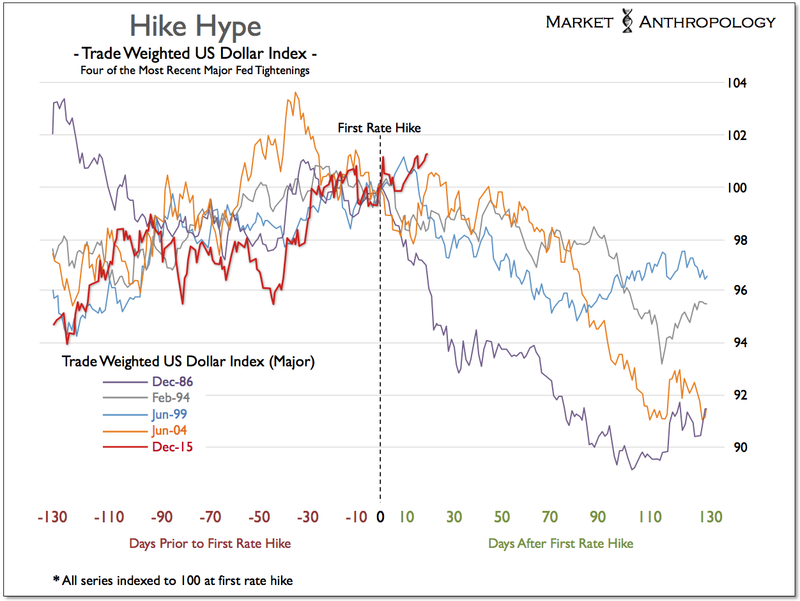 Going forward, we expect the breadth of outperformance versus the dollar to become more widespread as the Fed walks back their own expectations that should eventually support a rebound in a broader basket of assets closely tied to the value of the dollar. 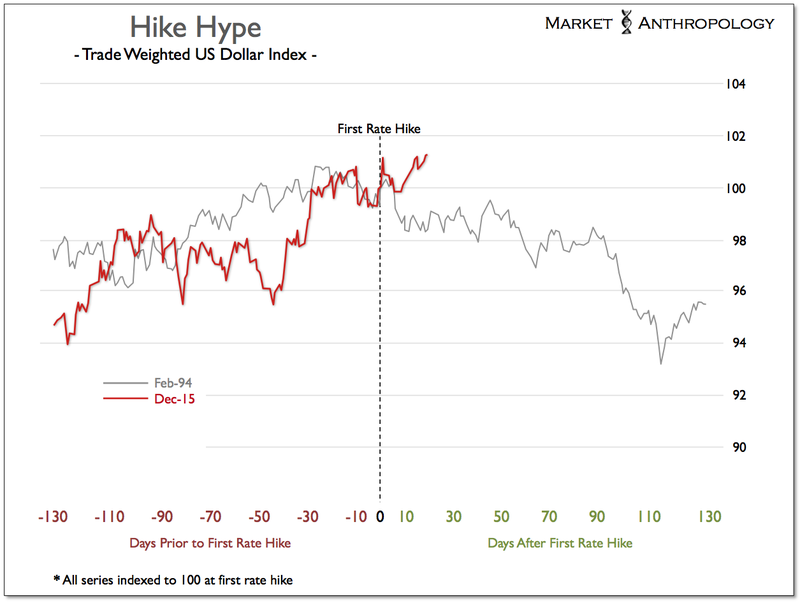 As a parting thought/jab, we’re reminded of an old quote that aptly sums up the hype and expectations towards the dollar over the past year.